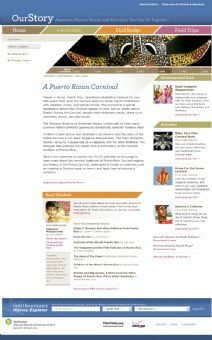 Explore Hispanic Heritage Month with your students using lessons, podcasts, activities, and primary sources. This image is of Cesar Chavez's Union Jacket from the collections. Students can read the stories of immigrants from Mexico, Cuba, and other Latin American countries, and view objects related to the journey to America. Students can also learn about the experiences of workers in the in the mid-twentieth century Bracero guest worker program. This reference page is included in the online exhibition entitled America on the Move, which focuses on transportation in US history. 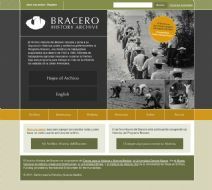 This website provides online access to a collection of oral histories, photos, documents, and objects related to bracero history. Students can browse the archive, use social bookmarking tools to share resources, add their own notes and make a poster using items from the archive, and contribute to the archive by adding their own stories about the bracero program. The Smithsonian's National Museum of American History is part of a consortium of museums, universities, and cultural institutions documenting and preserving the history of the bracero program, a little-known chapter of American history in which an estimated two million Mexican men came to the United States between 1942-1964 on short-term labor contracts. 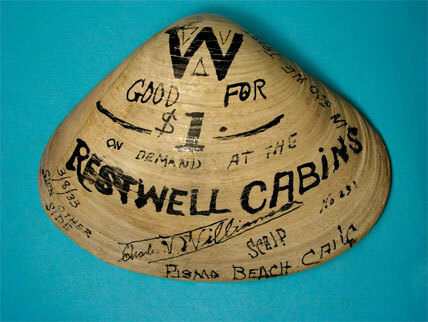 The Bracero History Project has recorded more than 600 oral histories and has collected many objects. Learn more about Hispanic Heritage by exploring different topics through American stamps such as: Hispanic Contributions to the Americas, Explorers, Settlement of the Southwest, Historic Architecture, Liberators and Heroes, International Cooperation, Reformers, Music, Arts, Dance, Entertainment, Journalism, Sports, and the Military. Stamps illuminate what we value as a people and a culture, and the National Postal Museum’s "Celebrating Hispanic Heritage: People, Places and Events on Stamps" sheds new light on the many contributions of Hispanic Americans and Latinos to the exploration, culture, growth, and defense of the United States. 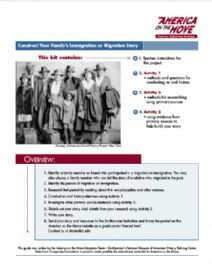 In this activity kit, students will use primary and secondary sources, and conduct oral history interviews to construct a family immigration or migration story. The kit contains step-by-step instructions, sample interview questions, and research guidance. The kit can be used in conjunction with a 28 minute streaming video called Creating Stories: America on the Move Electronic Field Part 2. It is included in the online exhibition entitled America on the Move, which focuses on transportation in US history. 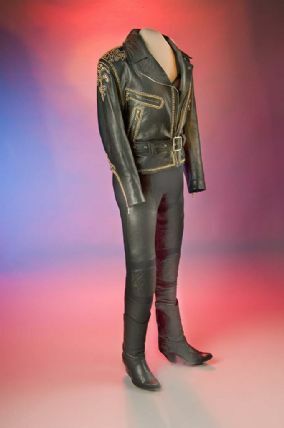 This is a Bata Cubana, or Cuban Rumba dress, donated to the Smithsonian by Celia Cruz, the great Cuban salsa singer in 1997. 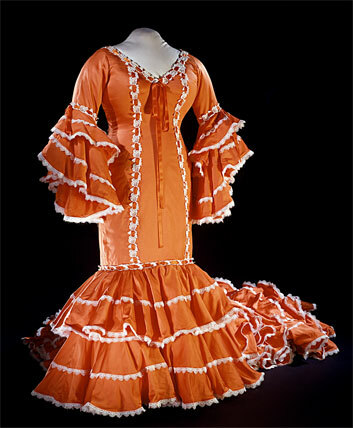 An adaptation of the traditional Cuban rumba dress, it was made in the United States by Cuban-born designer José Arteaga. The Bata Cubana has its roots in the 19th century, with origins as diverse as the multicultural makeup of the people of Cuba. It brings together influences from Spanish, French, and African culture and dress, combining theater, fiesta, and the spectacle of carnival with slave and gypsy dress. The Bata Cubana is a garment worn for performance on stage or cabaret. Celia Cruz's Bata Cubana is made of orange polyester satin, trimmed with white nylon eyelet along ruffle-edges and eyelet beading along seams with inserted orange ribbon. The Bata Cubana was Celia's preferred performance costume. Learn different aspects of Día de los Muertos and how it is celebrated and practiced. 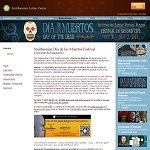 The Smithsonian Latino Center (SLC) presents a Dia de los Muertos 3D experience in the Smithsonian Latino Virtual Museum (LVM) illustrating customs and beliefs varying from ancient Mesoamerica to those currently practiced in today's Latino culture. Join the SLC in celebrating and exploring Latino cultural heritage through this holiday for honoring the dead and the cycle of life and death. During World War II, America began its largest experiment with guest Labor, The Mexican Farm Labor Program. Commonly called the bracero program, this little known chapter of American and Mexican history touched the lives of countless men, women, families, and communities. Learn about the bracero program and the Smithsonian’s initiative to document it with curator Stephen Velasquez. The resource set includes a teacher guide and student worksheet. Student activity collection analyzing the work of two very different Mexican American artists, identifying aspects of culture and exploring expressions about Latino experiences in art. Included in this collection, are five paintings highlighting Latino families, paired with observation and analysis questions and interviews with the artists, Carmen Lomas Garza and Jesse Treviño, as well as podcast analyses of the paintings from the museum's director. 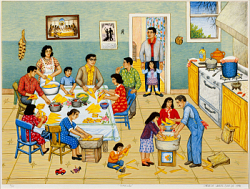 As a supplement, students could read a book by Garza depicting her childhood memories of growing up in a traditional Mexican American community, or lead a discussion comparing this artwork with other images of families found in the Smithsonian collections. This resource offers audio samples of Cruz's music and video clips of her life and performances. In addition to salsa, Celia Cruz performed many genres of Afro-Caribbean songs, including the Cuban son, Puerto Rican bomba and plena, the Dominican merengue, the Colombian cumbia, Brazilian music, blues, jazz, rock & roll, and dance music such as the rumba, mambo, and guaracha. Her repertoire showcased the power of her voice, as well as her skill and mastery of rhythmic complexities.